The BloqUV 24 Cover Up has a UPF 50 plus rating, blocking out 98 percent of the sun's harmful rays. The cover-up dress is great for the beach, pool, boating, or any of your outdoor activities. The racing drawstrings allows you to wear it at various lengths. We recommend ordering one size up. 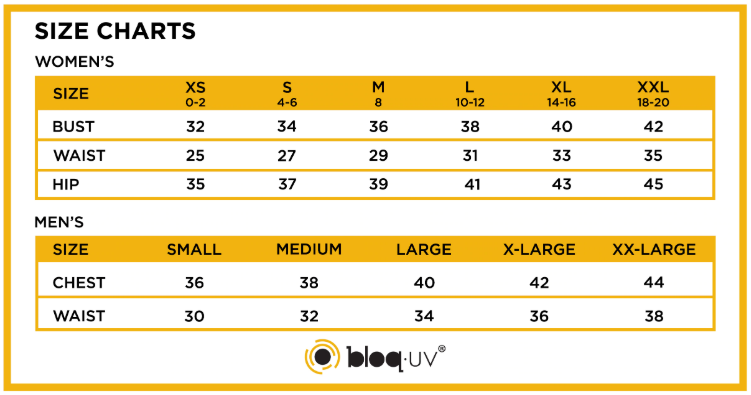 BloqUV customers have peace of mind that all BloqUV clothing provides UV protection and blocks 98% of sun's rays (UVA and UVB). Fabrics undergo 40 home launderings and 100 hours of simulated light. BloqUV provides a minimum UPF 50 = blocking 98% of sun's rays. BloqUV customers have piece of mind that all BloqUV clothing provides. UV protection and blocks 98% of sun's rays (UVA and UVB). Research proves UV exposure increases skin cancer, premature aging and other skin damage. According to a Forbes.com story about consumer spending habits keeping fit remains one of the top 10 priorities for Americans. New York Times reported on May 16, 2010 “While the death rate from— the most severe skin cancer — has been declining for 20 years for people under 50, men over 50 have the highest increase in death rate, 3.2 percent a year since 2002. The highest annual increase in incidence of melanoma is among white men over 65, 8.8 percent a year since 2003. And while there’s also rapid growth among young white women ages 15 to 34 (40 percent of 18-year-old women have used a tanning bed in the last year, compared to 8 percent of men, according to the American Academy of Dermatology), nearly twice as many men as women die of skin cancer each year”. Cancer of the skin is the most common of all cancers in the United States. Melanoma represents only 4 percent of all skin cancers in the U.S. but accounts for more than 75 percent of all skin cancer deaths. Although exposure to the sun's ultraviolet (UV) rays is said to be the most important factor in the cause of skin cancers, about 70 percent of American adults do not use sun-protection measures. 90% or more of melanoma is caused by ultraviolet radiation either from the sun or tanning salons. Melanoma is the most common cancer in women ages 25-29 and second only to breast cancer in women ages 30-34. Over 80% of a person’s lifetime exposure to the sun occurs by age of 18. Skin cancer is one of the most common and fastest growing forms of cancer in the USA. In fact, one in every 5 Americans will develop skin cancer in their lifetime (Skin Cancer Foundation). BloqUV uses high quality soft fabrics. The fabrics are created to withstand physical abuse with proper care. No chemical are added to our fabrics for UV protection. BloqUV's high performance fabrics undergo extensive research and active testing. Tumble dry or hang dry (saves energy). Do not use Velcro® on the fabric to avoid grating. BloqUV is based out of Miami, Florida and is a leader in sun protective apparel. BloqUV apparel was designed to fit the lifestyles for people who live active outdoor lifestyles.